Read about how schnauzer mom Nicole solved her schnauzers health issues by changing their diet. 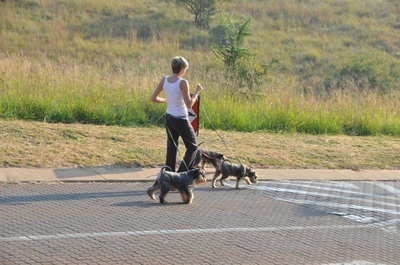 I have 3 Schnauzer “children”; Storm, Zoe and our newest girl Roodewaal survivor Pippa. 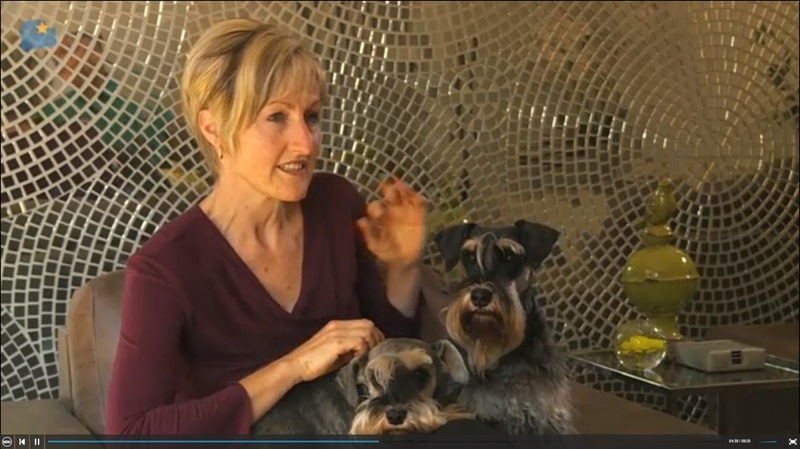 They eat a raw food diet and are healthy, slim, allergy free bundles of energy. It wasn’t always that way, though. Storm would lick and nibble his paws and lower legs to the point that he exposed the skin and then licked that into raw sores. The cortisone tablets and lotions and ointments prescribed by the vet had limited success. I have, not so fond, memories of sitting with him on my lap holding his face away from the area for 10 minutes so that the ointment could do its job! Twice a day! And when the fur grew back it retained a dark colour from continued licking so I could see that the problem was still there. That brought me to the point where I started searching the internet for information on causes and solutions for those darn itchy paws and tummy upsets. And this is what I discovered: dogs do not digest and process starchy foods, grains and sugars well. They do digest and thrive on animal protein and some bones and vegetables. A lightbulb moment! The ingredients on the packets of dog kibble (and by now we had a large sampling of them all half full) made it clear that these foods were starch and grain based with little protein. Where to from there? I asked the “expert”, my vet, and got a very wishy-washy response. I went back to the internet and entered a world of opposing opinions and controversy. So I just trusted my doggy-mommy instinct and started experimenting with raw meat, raw veg and some fruit. I literally let the dogs tell me what they liked to eat and paid attention to their condition of their skin, their weight and kept an eagle eye on those pesky paws! Red muscle meat 2 x per week including a small spoon of organ meat which is sold at retailers as Pet’s Mince. This does not include pork which has a high parasitic risk. Scrambled eggs which I bulk up with Acana kibble 1 x per week. All the meals have a small portion (about an ice cube size) of vegetables included. My dogs did not enjoy raw vegetables much and I often had the veggies left in the bowls. 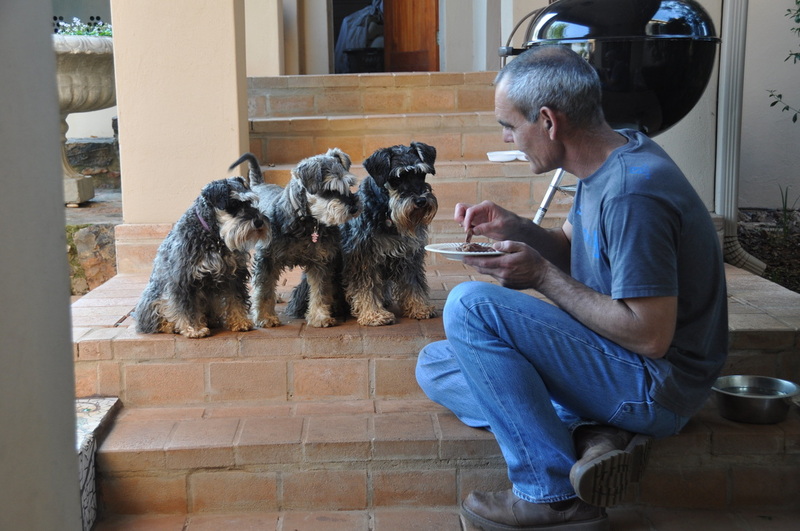 The turning point was when Pippa, newly from Roodewaal, turned her nose up at a broccoli floret in her bowl and my son said; “You see, mom, not even rescue dogs like broccoli!” The Afrikaans have a lovely saying, “aanhouer wen” – he who perseveres, wins - so in that spirit I relooked the vegetable offering and now I use all the bones from the raw meat that are too big and too hard to give to the dogs, because they can cause broken teeth and constipation, to make a nutritious bone broth. I then cook the vegetables in the broth, mash them and freeze them in ice cube trays to be added to the meals as I need. I frequently add some apple or berries to the veggie mix for added nutrients. Nobody turns their noses up at my veggies anymore! Mommy 1, tasteless veggies 0! Determining how much to feed is so easy with the great calculators available on many raw dog food sites that are based on your dog’s current weight. There is help for too skinny dogs, overweight dogs and tweaking based on their activity level. And the results you ask? The unspecified gastro has never returned (I think the vet had to cancel the luxury German car on order based on potential future earnings from us!) and all three have supple and flake free skins. Storm’s paws are beautifully clear and covered with fluffy clean fur and the only sign of the lick returning is when he has sat under the bird feeder and stolen pieces of bread that the birds drop. There is nothing wishy-washy about my recommendation: raw food every day for good health in every way!